Below is a video discussing MOI & Balance Matching. I have received a lot of questions on those concepts recently. This is Part I, going over the basics of what MOI matching is. Recent studies have shown that the game of golf has lost 5 million golfers in the last decade. If there’s one thing that I feel that golf needs to do, it’s keep the players they have instead of solely hoping to find new players. Don’t worry, golf is not alone. I’ve worked in several industries and notice this happening all of the time. Industries tend to think that the diehard consumers will always be there and they start to focus on acquiring new customers. It’s not entirely a bad idea, but in the end most of them neglect these diehard customers too much and lose them. Recently, there has been discussions about making the actual golf cup size much larger. I think this will completely fall flat on its face. Before I got into golf I loved playing basketball and following the sport. Nobody I have ever come across has hated basketball because of the 10-foot rims and then started to love the sport because they could lower their home made rim to 8-feet. In fact, the WNBA initially started off with a 9-foot rim and the league was far less popular. As many women’s basketball fans often tell me, they appreciate the woman’s game because it focuses on fundamentals rather than dunking and shooting long shots. Having a sport that is difficult is NOT a bad thing. It’s a GOOD thing. It appeals to the person’s sense of achievement to do something that is very difficult to do. At best, the entire 15-inch cup thing is a gimmick with no long-standing value. But, that is where the crux of the situation lies. We need to find a way to get golfers better at doing something very difficult; playing good golf. It is part of the reason why this blog is very instruction-centric. I believe that the quality of golf instruction will play a large role in the industry for years to come. In fact, that is all the industry was filled with. Instructors that used very simple terms, were afraid of details and didn’t understand complexities themselves. As one reader put it, it’s a ‘Bagger Vance Style’ of instruction. It became confusing when things didn’t make sense. Instructors telling you things that contradicted themselves. Or them saying ‘all the good players do this’ and to find out that…no, there are plenty of good players that didn’t do that. So when I got back into the game and started to seek out as much information about the game as I could; I was also playing a lot of golf with high handicap golfers. In fact, I rarely get to play golf with a single digit handicapper. 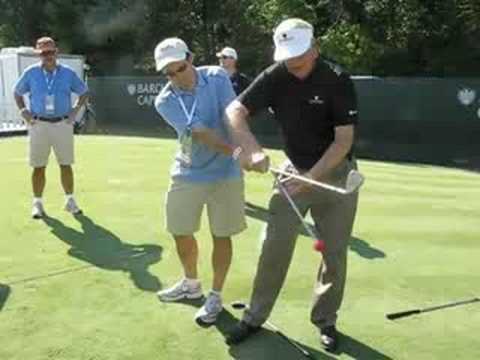 What’s been interesting between following golf instructors on the Internet and playing most of my golf with high handicappers that do not get lessons is the disconnect between the two groups. And I think the big reason for this is that the golf instructors usually do not get to play much golf and if they do they usually play with low handicap golfers. And if they do play with high handicappers, it is typically with a student of theirs and that student is on their ‘best behavior’ in that round. 1. Almost every single time a golfer does ‘keep their head down’ and their ‘eye on the ball’ regardless of the quality of shot. 2. Getting the ball consistently airborne has to do with so many other factors. The main benefit of good instruction for a high handicap golfer is NOT being able to just consistently get the ball airborne. It is being able to hit the ball better than the golfer thought they were capable of doing. And that will translate into lower scores. And I have seen this time and time again from formerly high handicappers that receive quality instruction, not only do they hit the ball better than they imagine they were capable of, but they become readily addicted to the game. That means more time and money spent on the range. More time and money spent on the course. More time and money spent in the pro shop and more time and money spent in the restaurant. It also means trying to bring in family and friends into the game as well. With quality golf instruction, everybody in the industry benefits. But, the golf courses need to step up their game as well. They need to seek out and demand quality golf instruction. But, they also need to see the value of quality instruction and what it can bring to their course. And that will mean better compensations and working conditions for the instructors. And it will also mean getting the instructor out there on the course and playing golf to help the members out as well as providing occasional free clinics to get new golfers interested in the game and possibly becoming a member at the course or at least willing to pay green fees to play the course. And the other benefit of quality instruction is the pace of play will improve. Studies have shown that lower scores will generally improve the pace of play. It’s not that good golfers cannot be slow golfers and poor golfers cannot be quick golfers (in fact, one of my friends rarely breaks 90 and is one of the quickest golfers I have ever seen play the game). Golf courses should look at the hours of daylight and golf rounds as a supply and demand model. The longer rounds of golf take, that works against the supply of daylight the course has. And from the polls I have conducted, the #1 reason for golfers quitting the game is pace of play. So anything that can quicken the pace of play should be very important to golf courses. Instead of lowering the bar by creating 15-inch golf cups and allowing technology to override acquired skill and talent, we should look to golf instruction to develop that skill, strike a chord with our sense of achievement and develop relationships between the instructor, the golf course and the golfer. Then the game will have something that other sports simply do not have and that the people want.